I’m sitting behind my laptop, with a delicious slice of Victoria sponge cake and a cup of coffee. I’m smiling, because I turn 21 today. I had a great day today. Even though I had to kiss everyone in the office this morning. I hate that. Can’t we just shake hands? No? Please? Haha! I brought three cakes to work to celebrate, and even though they were a bit dry, they were delicious! I forgot I shared the day with a co-worker from the other office that’s on our floor so she had a box full of mini pastries to hand out as well. No need to tell you what the morning looked like on our floor. Party time! And as if all the yummy food wasn’t enough, the weather gods blessed us with sunshine and temperatures up to 27°C locally. Uh-mazing. My internship coaches let me leave early so I could enjoy the sunny afternoon and shop for that perfect prom dress I did not find. A little upset that I could not find a pretty dress anywhere, I went home to find my youngest sister behind the stove baking me pancakes. The cherry on this amazing birthday! Last year, for my 20th birthday I made a little list of expectations. I wanted to take photography classes, fly across the pond and make new blog friends. I did all that and more. It has been an awesome year where I traveled to the United States, got good grades, stayed in good health and where I could enjoy much love and laughter. For the next year I mostly hope to graduate from college and decide what I want to study for my Masters. I hope to travel even more, maybe to northern Italy, southern Spain or Scotland but preferably to all. I am still doubting whether I should go to Canterbury or not and I really, really should get back into blogging. Like… really. Happy birthday! 3 cakes, pastries and pancakes sound like a great birthday 🙂 I hope you get to travel a lot this year. Ah! Happy Birthday! Keep us posted on your travels 🙂 I always look forward to the lovely pictures! Happy 21st, love! That cake looks so good…I'm jealous! happy birthday, girl! sounds like it was a good one! Heel hartelijk gefeliciteerd! Gelukkig had je een leuke dag, op de afwezige jurk na. Ik hoop dat je een mooi nieuw jaar tegemoet gaat! Veel succes met je voornemens! I hope this next year is even more full of joy and surprises than the last! 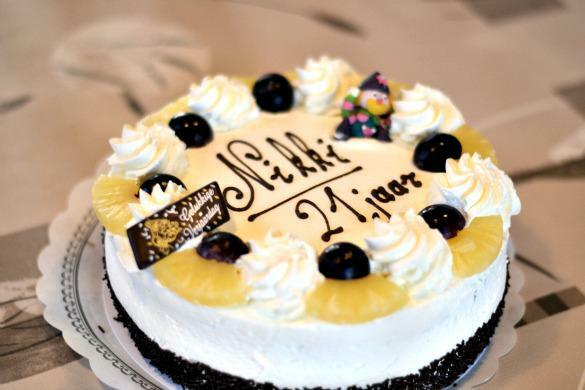 Happy Birthday, Nikki. Hope it's a great one!! Gelukkige verjaardag! Ben blij dat je een leuke dag gehad hebt. Waarvoor ga je wel naar Canterbury? Gewoon op te shoppen of iets anders? Ik kan je Canterbury absoluut aanraden, ik ga zelf bijna om de maanden naar daar gewoon om te shoppen en om onze inkopen te doen bij Tesco. En natuurlijk voor de typische Engelse sfeer. P.S. About those kisses and hugs… I know, right?! Een beetje laat maar toch nog een gelukkige verjaardag baby!